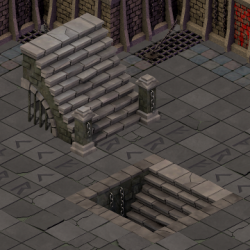 Isometric dungeon stairs, made for Flare's dungeon tile set. The up stairs are 256x256 and the down stairs are 256x128. They are designed for a 4x4 tile area, assuming base tile sizes of 64x32. I've attached the Blender model used (the .zip file). Note it's not really made for a 3D game (in a fully 3D game you'd want modular stairs that actually connected properly to other floors). Notice the side wall of the stairs (the brown part). It's mostly a flat polygon with a texture applied, plus several "bricks" that stick out randomly with the same texture. The bricks are just scaled cubes with the backface removed, and placed right next to the wall. Make each brick a different thickness (out from the wall) to get a good feel. Minimal effort for a nice result. Made a slight modification. Added chains to the downstairs model to emphasize the dungeon theme. In a 2d isometric game you can actually remove 3 of the faces of the protruding bricks, If you look at the below image you can see that these faces are never shown to the camera from your games perspective.